I was unable to find a complete step-by-step instruction on how to programmatically build Safari extensions, so I’m writing this post so others can see. This guide is for people running OS X. 3. Download this shell script and run it in the directory you download the xar archive in. The first argument to the script is the directory you want to install the xar bin to (you’ll use this directory later). 9. 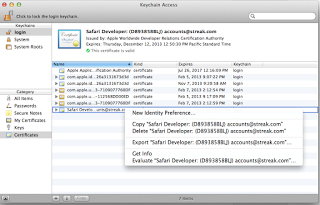 Go to Keychain Access and right-click on your certificate and choose Export. 15. Now for the build script itself, each project will be different, but the first part of your build script should get all the files necessary for the Safari extension into a folder with a .safariextension (ours is Streak.safariextension). 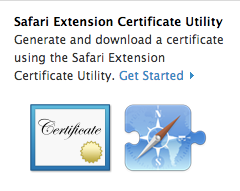 Don’t include your certificate files in the safariextension folder, they should exist outside of the folder. 16. Copy and modify this gist to get the part of the script that will generate and sign the compressed Safari extension file. 17. Profit! You should now be able to build your Safari extension from the command line. The great thing too is that you can checkin your cert files into your source control and other developers will be able to compile the extension as well — without generating their own certs. Just make sure they have the xar utility installed. Special thanks goes to mackyle for patching the xar utility to make this all possible!